Quite a number of times, after having seen an alert announcing operation on a precise frequency in which I have some hope of copying the activator, I have tuned my rig and sat on the frequency remaining QRV for the activator to show up and start CQing, while doing other things in the shack. The patient waiting has payed off several times to me. This strategy was made possible because there was an exact frequency announced in the alert finally respected by the activator who finally showed up on the previously alerted exact frequency. Unfortunately, alerting on an exact frequency and finally activating on that very same frequency is not always possible for many activators, as there are times of the day in crowded areas and bands where it’s often very difficult, almost impossible to find a clear frequency. This introduction was to illustrate how useful alerting on an exact frequency like 14.063 instead of just 14 is for the chasers and the activators too, of course. Now I want to focus on spots. From my point of view, there’s no point in spotting vaguely without precising an exact frequency. When I see a spot for an activator and the frequency information is as vague as 7-cw or 14-cw, I don’t even bother trying to find the activator because the signal will very probably be very weak and it will be impossible for me to find it. When a spot gives an exact frequency and I’m in the shack, I go there and sit on it QRV listening carefully for any weak signal coming through. Sometimes I don’t hear the activator, but I hear the other chasers working him/her and I wait. Waiting finally pays off several times. In this low part of the solar cycle period we are in now, I have often found that conditions change in a matter of some few minutes and an activator not copyable at all in a moment, becomes copyable, workable and finally chased after a few minutes of patient waiting. Again, this waiting strategy and its final chasing is only possible when an exact frequency information is given on the spot raised in Sotawatch. When signals are as extremely-weak+QSB-making-them-disappear as on many of the SOTA chases I currently do in these days, there’s almost no way of finding an activator’s extremely weak signal by just turning the tunning knob across the band. I wonder why some of us are sometimes raising spots with a vague frequency information like 14-cw, 28-cw, 7-ssb? 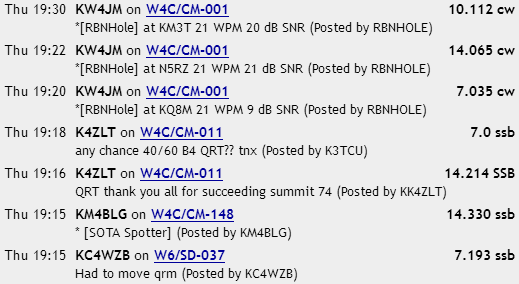 Is it due to not wishing to be found by many chasers to avoid having to deal with a pile-up, while having preagreed a secret precise frequency with some few chaser mates in order to guarantee the minimum 4 QSOs to claim the activator points? You need to read the comments that go with those spots Guru. In the Thus 19:18 case for K4ZLT, the spot is 7,0 because in the comment K3TCU is asking if K4ZLT will go back to 40m. But rather than posting the actual frequency K4ZLT is using along with the request, the vague frequency of 7.0 is used. It’s been written many times that a lot of activators do not check for requests when on a summit. Also people have been told by the MT that if they do spot someone with a request to move, they should spot the frequncy being used not where they want the activator to QSY to. MT policy is to delete spots that are for a desired rather than real frequency. Had I seen these they would have got the chop as quick as I could hit delete at my browser. I have a concern with SECRET Activations. If one assumes a Mountain Goat has four friends chasing, the Goat better hope for favorable conditions in all directions. If one radio fails the expedition is worth nothing. I don’t see a point in ANY Goat denying support for themselves or for other Goats. That’s a quick way to lose the larger network. My problem was due to having spent this week testing my remote station and instead of watching spot on my laptop I’ve been seeing them on my smartphone. If you have the view configured as Compact, seeing the comments for a specific spot is still possible, but it’s more difficult and it requires some skills because if you touch the screen on top of the summit reference, it will automatically show you the details of that summit instead of the comments of the spotter. Exactly what you get when you left-click on the summit reference of a spot from your PC. It’s been written many times that a lot of activators do not check for requests when on a summit. Also people have been told by the MT that if they do spot someone with a request to move, they should spot the frequncy being used not where they want the activator to QSY to. Since I have my SOTAwatch view configured as Compact, I’d never see any request for me to change band or anything, because the comments are not seen by default on the smartphone screen unless you perform a careful and skillful operation, which I oviously never do while I’m on a summit activating. Many times I will indicate that I am QRT due to some unforeseen issue, i.e. weather or radio equipment failure. I will use a frequency at the band edge and use “Other” for the mode. In the comments I will indicate I am QRT and the reason why. Just a courtesy to the chasers. …Including a classic post asking for 60/40 2 minutes AFTER the activator has indicated they’ve gone QRT. If you miss 'em, you miss 'em. Don’t clutter up with blank spots the activator is probably already ignoring. In the comments I will indicate I am QRT and the reason why. Just a courtesy to the chasers. I never do this and I would recommend you and others doing it to stop doing it. The spots are just to inform about frequency and mode of current SOTA operations and sending spots to request things to the activator or to announce QRT, QRX, etc just contribute to pollute the list of actual spots with messages which are not actual spots and push the actual spots down in the list making them dissappear too quickly. When I’m going to QSY, QRX or QRT, I just announce it on the frequency I’m transmitting on for the chasers and other people listening on that frequency. I think that’s enough. Not when you are fighting contest or other QRM on the frequency its not Guru. The use of spots by the ACTIVATOR to pass information to the chasers I fully support - the other direction is questionable IMHO. Actually, is there a case for a ‘special’ frequency value of ‘QRT’ for when an activator wants to indicate they have stopped? This would avoid the need to generate a comment which chasers might not see anyway. The way I see it correct is when the activator makes QSY and he sends a new spot informing of the new frequency he is going to start transmitting or actually transmitting already. Sending a new spot to say I’m going QRT is IMHO useless and pollution to the SOTAwatch cluster. All this is useless information. All we chasers want to see when looking at SOTAwatch spots is which activator is currently transmitting on which frequency and which mode. Any other sort of messages are pollution to the custer and the risk for the SOTAwatch cluster becoming another chat room. We have to agree to disagree Guru. I for one believe it to be the right thing to do, to indicate when I have gone QRT, and certainly not “pollution” as you put it. Such a message can also be a safety net for those activating on a difficult summit - if they should take an hour to get down after they have gone QRT and they are not down after two, some action may be needed. Without an indication when a station goes QRT, this timimg information would not be available. Remember please “The activator is King” and what the chasers may or may not “want” is secondary. (by the way I chase more than I activate). In response to Colin’s suggestion - the use of 14.000MHz or 7.000MHz etc. as an indicator of “not a normal spot” was covered previously in the thread but I agree the use of such a frequency so that chaser can chose to ignore the spot if they wish is fine with me. I agree Ed, we have to agree to disagree. Any activator attempting a challenging activation will surely have some back up communication method to keep his/her friends/relatives informed and I’m sure they would be able to trigger an emergency call in case of an non return of the activator within a reasonable time. I believe no activator will rely his life or safety on the hams watching SOTAwatch. This a very important point and I’m going to type it slowly in case anybody cannot read fast. Spots are for spotting you are on a summit and your mode and frequency. That is all. 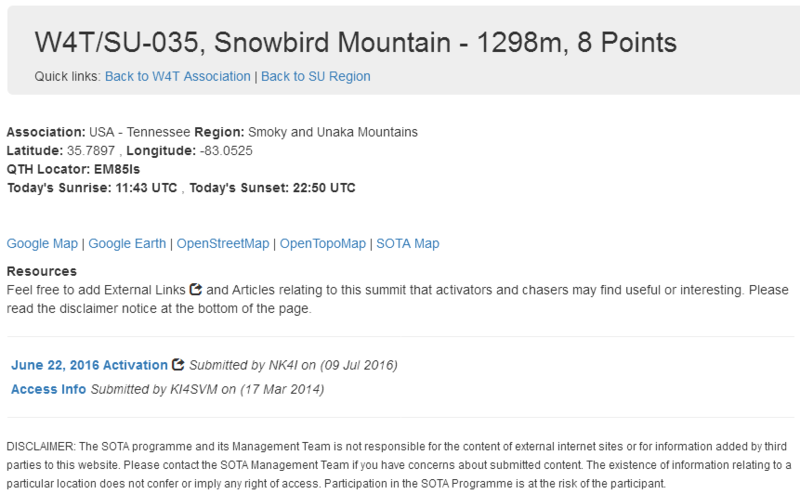 You cannot rely on the activator reading spots on a summit, many do not. The MT do not object to requests in comments as long as you spot the mode and frequency the activator is currently using. Not some abstract frequency or the frequency you want the activator to move to. If you do this then your spots will be deleted and if you repeat this then don’t be surprised if you find your ability to spot is removed. QRT spots are a waste of time whether they are frequency and mode accurate or abstract. Again, don’t be surprised if they are deleted and your spotting rights are suspended. Finally, and this is crucial. Under no circumstances will the SOTA MT allow spots etc. to be used for any kind of safety messages. Certainly not for “I’m OK” messages. If we spot this kind of misuse then you will have your access withdrawn. It doesn’t matter whether you think this is a good idea or not, no safety messages as the SOTA MT will not be held responsible. Your safety is your responsibility and yours alone. It’s up to you if you want a 3rd party safety beacon (SPOT or InReach) or an EPIRB or not. Just do not expect to use any SOTA service for any safety messages. Thank you, I was hoping that an MT would make it clear. The "Acceptable Use Policy" only states "Spots will sometimes be removed if they are deemed superfluous, especially on busy days. This will generally be because the spot is not adding useful content but merely repeating information made clear in a previous spot. Please do not be offended if this happens to you. Again, the motive is to make the facility as useful as possible to everyone concerned." Can you please add what is considered an improper spot in the "Acceptable Use Policy" so that it will no longer be abused? I will no longer indicate that I am QRT. I’ve just realised the false spotter has been again the same ham K3TCU. @K3TCU, you better read this thread and change your spotting habits before you get a fine from the MT. As a previously frequent activator, if I alerted at all, it would be for a vague band such as 7 ssb. I would like to alert for 7.118 for example, but more often than not, that freq may be in use by contest or iota, flora & fauna etc. At least if you know I’m on 40m, you may have to tune around to find me. How on Earth did SOTA manage in the old days without the spotting engine. I stopped this awhile ago as well. Not that the MT needs my philosophical approval or anything, but the idea that the spotting system is for spotting (not chatting) makes lots of sense. 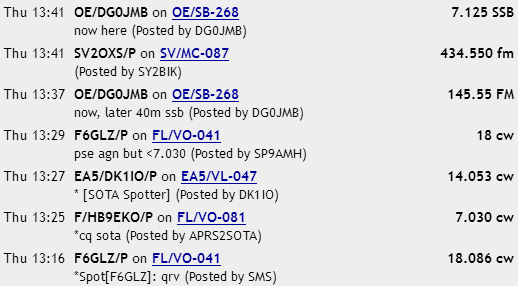 I do think the fact that people use the spotting system for chatting so frequently indicates the need for a real-time communication channel (or channels). Lots of us have come up with ad-hoc solutions for that. Maybe it makes sense to have a more official solution? Or not! (I’m fine with getting “go back to 40m” texts on summits if I have service). Why are people discussing “spots”? These things don’t happen instantly, it takes a certain amount of time to compose a spot and some of us are “peck and hunt” typists, so it is quite possible that the QRT spot came while the station had the compose screen up. It doesn’t look to me as the chaser had not seen the previous spot from the activator announcing his plans to QRT after a brief operation on 17m. It looks to me like the chaser saw the activator’s announcement and he begged for a last chance for him to chase the activator on 60m.